Excellently cut for healing purpose vogel cut powerful wands specially handcrafted from natural Rock quartz crystal and other natural stones. These vogel wands vary in sizes and facets.These are special wands made and high quality rock crystals are used with maximum clarity to give the best effect. 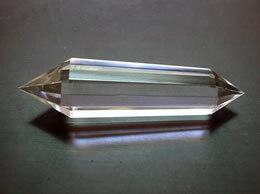 Vogel cut multiplies the healing power of the crystals and make it more powerful and effective. 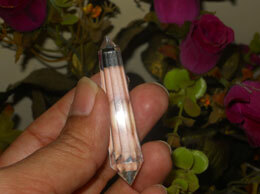 The Double Terminated quartz crystal wands have double terminated pints which send as well as receive energy. So they are used in healing were the energy needs to flow in both the directions. 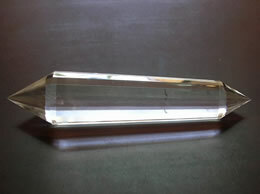 We have collection of Double Terminated quartz crystal, Quartz Crystal, Healing Quartz crystal, Natural Quartz Crystal and Vogel type crystals. These wands are perfectly designed and cut to increase the healing power. 12 facetsApproximate size 5.5 Cm in length.